Comments: In our view about the only thing this coin has going for it is the golden color. Even when you pull the color out and look at the coin in black and white it just has too many bag marks and scuffs to make the grade. We would grade this coin down a notch or two because the primary damage is on the cheek and it is heavy enough to be a real distraction. This coin is also a little unusual because it is not either a PL or DMPL coin. Most of our VAM 54 coins are up in the class of PL or DMPL. Perhaps under all that color there was once a much higher quality coin. 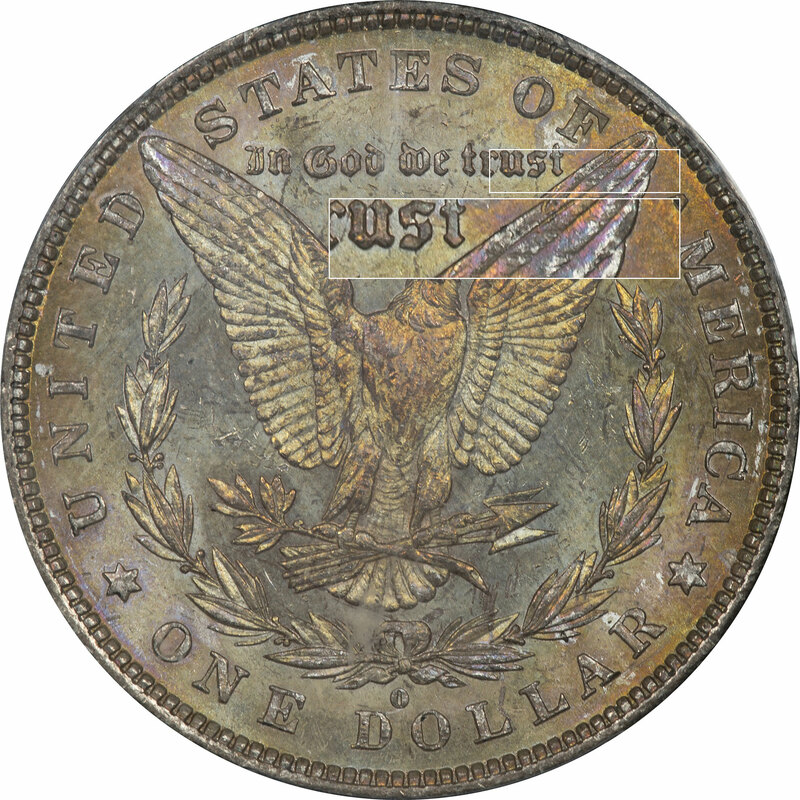 In addition to the rough handling, something has discolored this coin as well as colored it. Most of our VAM 54 coins are either PL or DMPL, but not every coin leads a charmed life. Some coins must reside to the outside of the bag and experience all that is going on in the external environment. 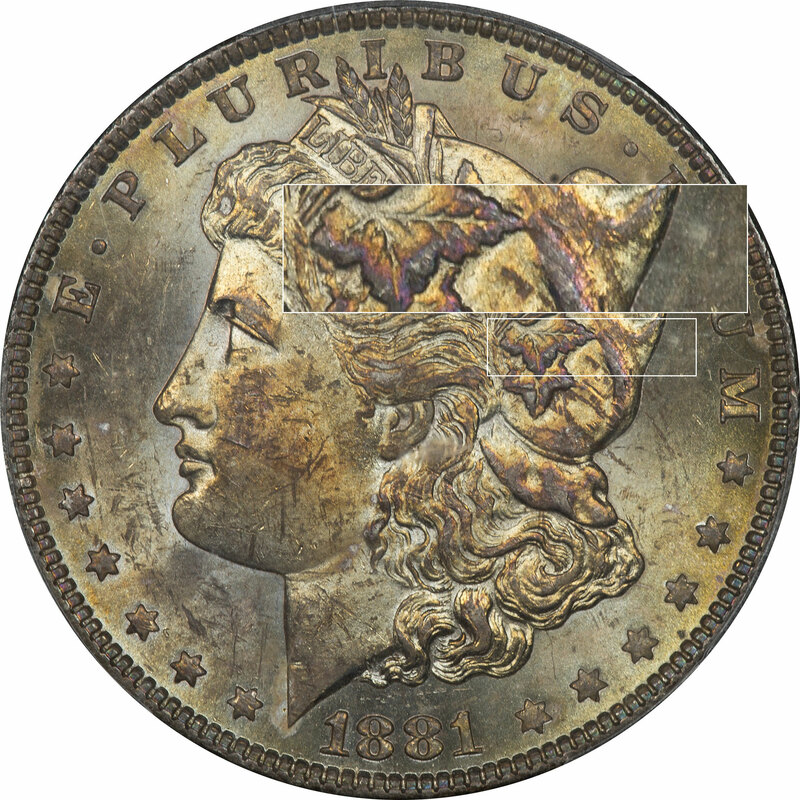 To us this coin appears to have heavy moisture damage in addition to all its abrasions and bag marks. When we enlarge the area around the cotton leaves and the eagle's left wing we see a little more color spectrum than is initially obvious. It is these colors and not the golden color that may give away this coin's degree of toning. The area of color includes gold, magenta, and black. The black pushes our opinion toward the end of the toning cycles and not the first. The coin could just be dirty, but the black is terminal coloration and drags us much closer to the end.